Fall temperatures are officially here! Time to get out my soup and stew recipes to warm us up come dinner time. This recipe is often requested by my daughter. She loves Tortellini Soup and with Rob working outside most of the day this fits the bill of filling and warming him up. I often serve this with some fresh biscuits out of the oven. We got our Shopease Foods shipment of food in last week so my freezer is full when it comes to making meals for my family. The choices are unlimited! We get a delivery of meat that will last us 3 months and our freezer is full to the top. It is so nice to have everything I need to make a good meal for us for dinner each night without having to run to the grocery store. In a soup pot combine broth and water and bring it to a boil, add all the other ingredients. 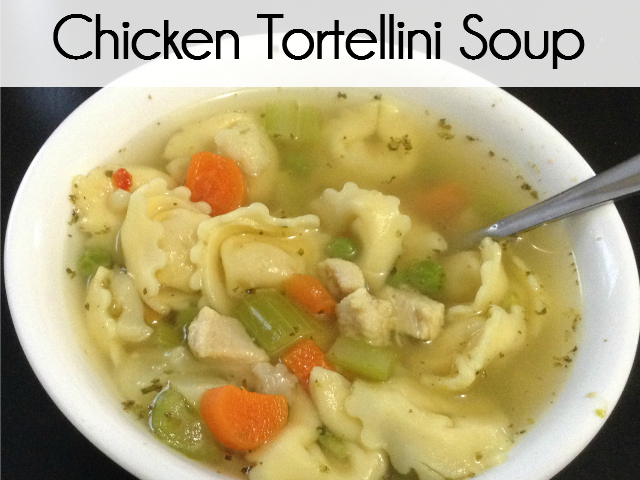 Cook for 15 to 20 minutes until tortellini is cooked. When I make this for my family of 4 I double the recipe and it usually makes enough for leftovers for lunch the next day. We often serve it with bread sticks. Have you ever thought of having a meat delivery like Shopease? If you have done the meat delivery for 3 months, 6 months or year how did you like it?